The Art of Painting Buses. | Come Here To Me! The Art of Painting Buses. Sign-painting, sadly, is an industry in decline in Dublin. They said that Brendan Behan was the son of one of the finest sign-painters in Dublin, though Stephen Behan was by no means alone in the industry. Brendan himself dabbled in the field, before discovering other talents. Kevin Freeney, born in 1919, painted “at least 700 pubs and shopfronts” in the capital, and was a frequent sight on the streets of Dublin once upon a time, carrying his paint and brushes everywhere. The Freeney story was brilliantly told in the short firm ‘Gentlemen of Letters’, which brought the story right up to the present day through artists like MASER. The Freeney family have continued a family tradition for generations now, always maintaining a great pride in their history. An archive of Kevin Freeney’s work, available to view on Flickr, is testament to that. 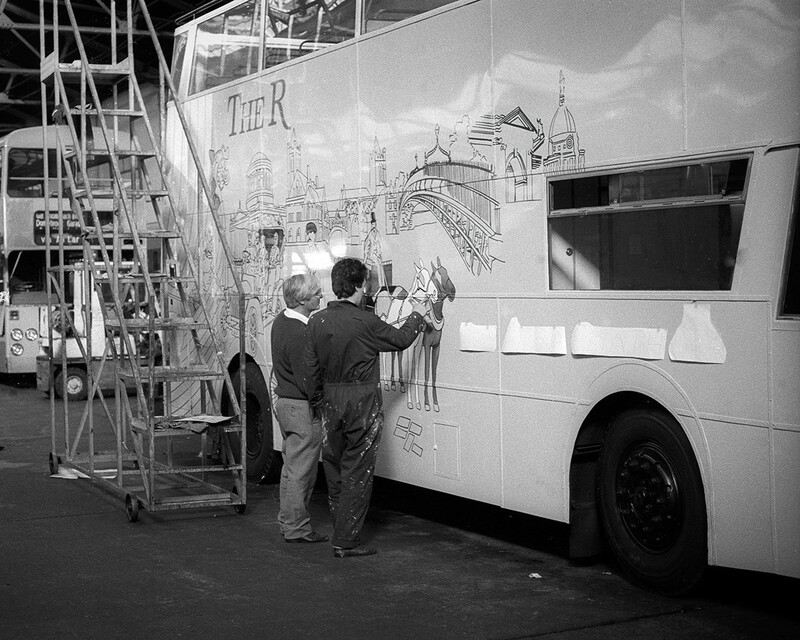 A new book, entitled The Art of Painting Buses, demonstrates that the family continue to make their mark on the city. 1988 was the year of Dublin’s Millennium. 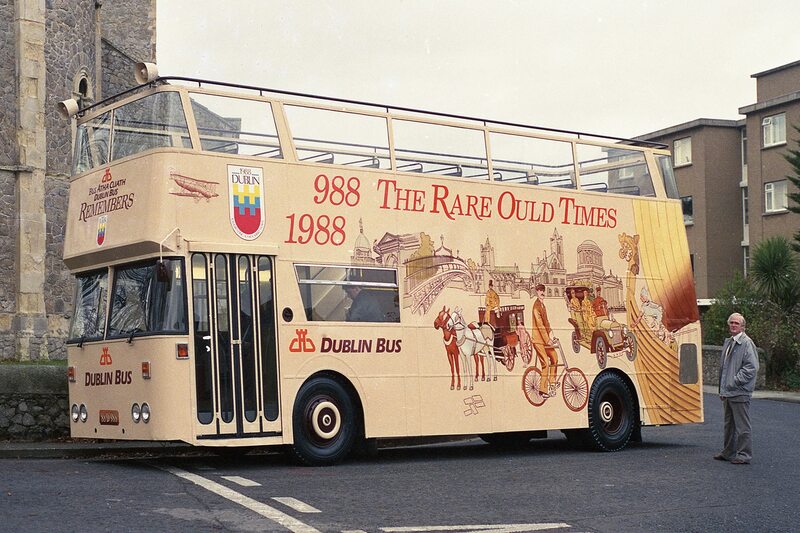 Well, it wasn’t actually the Millennium (the Vikings were here long before 988, we’re sorry to tell you), but 1988 is remembered in Dublin today for the festival and celebrations of all things Dublin and old. There are lasting monuments in the city today to 1988, for example the mosaic tiles on the side of St. Stephen’s Green Shopping Centre, the Molly Malone statue and the milk bottles in your attic. 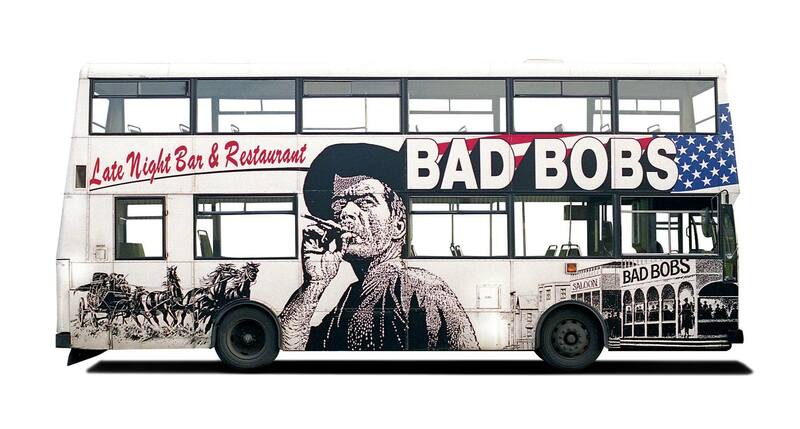 There are also plenty of memories, and readers may remember seeing the above bus driving around the city. Painted by the Freeney’s, it marked their first foray into, the art of painting buses. It was not to prove the last. From ‘The Art of Painting Buses’. The sheer labour involved in the art was immense, and sometimes the work tedious. In an interview with the Irish Independent, Tom Freeney remembered that “Some buses were tougher than others. In 1993 we had to hand paint 38,652 garden peas onto a Hak Produce bus. 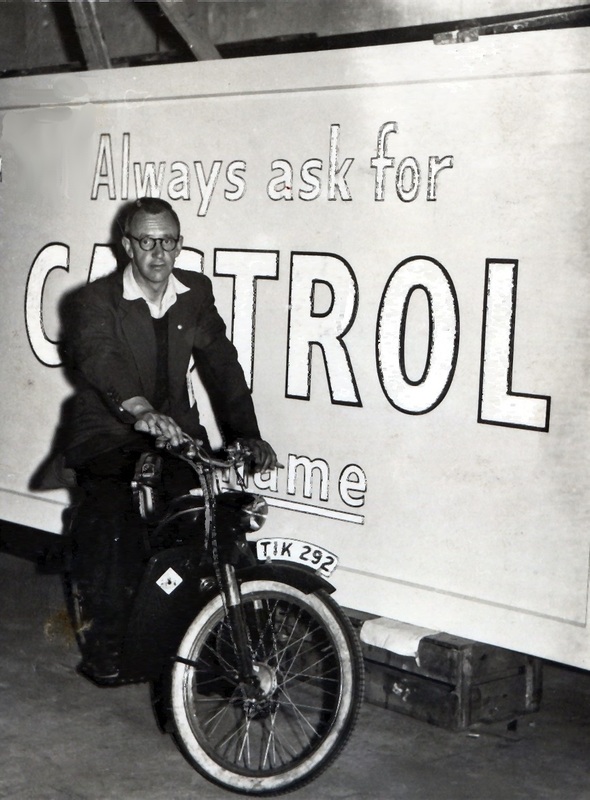 It was very hard to motivate yourself knowing you were facing into another day of peas.” For me, some of the most interesting images in this collection are those advertising Dublin businesses no longer with us, while others remain familiar names. Bad Bobs. From ‘The Art of Painting Buses’. Today, Freeney’s Graphics continue family traditions. 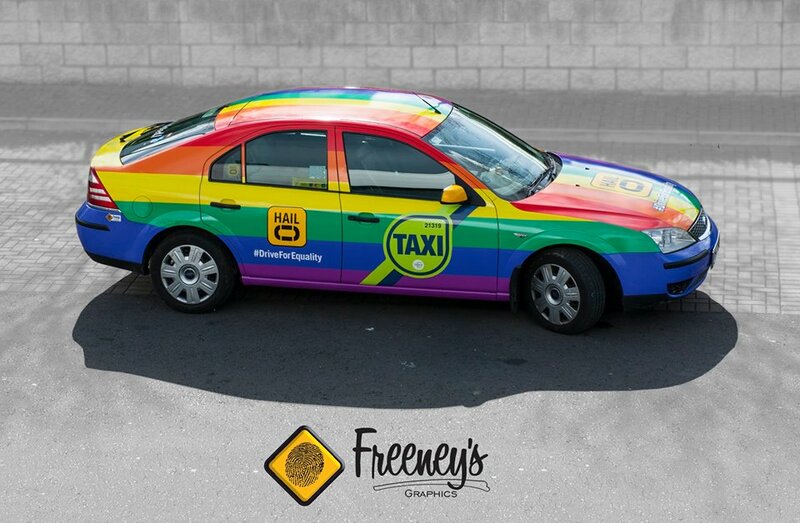 With the day that is in it, it’s only right to draw attention to this recent wrap on a Hailo taxi! Few families in Dublin have remained as firmly rooted in a family tradition as the Freeney’s, and The Art of Painting Buses is a fine record of a job well done. Image via ‘Freeney’s Graphics’ Facebook. For more information, see The Art of Painting Buses website. While I guess it’s not one of Freeney’s (it looks like a photo) this does illustrate the great scope for humour provided by the illustrated bus. That’s incredible! My family company is buses. Nowadays we don’t paint them unless it’s a clean base colour. Instead we “wrap” the buses and this way we add advertisements etc. 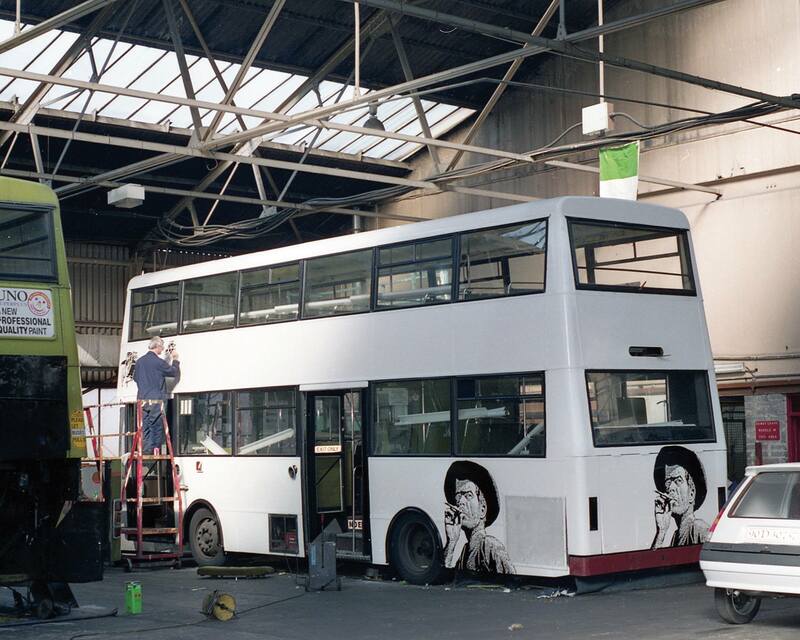 It’s amazing to think that even not so long ago these craftsmen were handpainting the buses. I’m off to take a look for that book. Thanks for sharing.